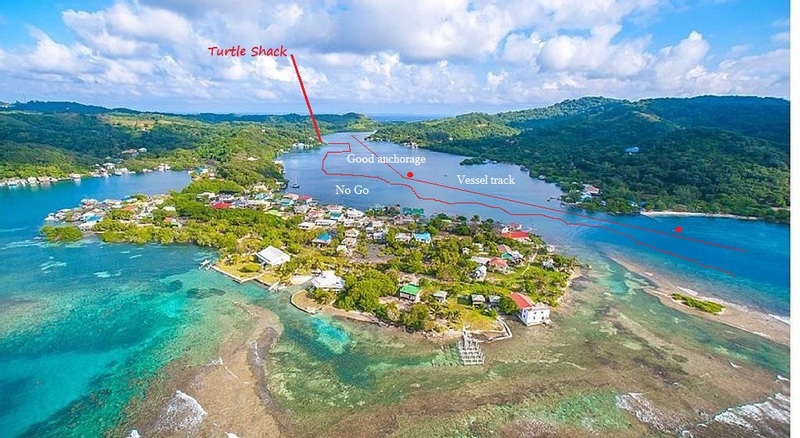 Turtlegrass is situated in Calabash Bight, Roatán, Bay Islands, Honduras, C.A. We currently have over 400 feet of commercial grade docks, with a combination of side or stern mooring. The slips will accommodate boats of up to 48 ft length and 9 ft draft, and we have one catamaran slip (30' wide). Calabash Bight is one of the best hurricane holes outside of the Rio Dulce but, unlike the Rio, you can fly down and be sailing the same day. There are individually metered 30 amp shore power, WiFi, and we can procure clean diesel at a competitive price, delivered to our dock. We also offer systems service and bottom cleaning for our customers. Shipwright and Sail/Canvas maker on site. All in water repairs can be handled on site. Lay a course of 320 Deg. Magnetic and you will spot the next marker (Red) and stay in good water on this course. 16 23.893 N 86 20.374 W One of the anchorage spots. Once inside you can anchor in several locations up and down the bight by eyeball navigation as water is clear enough to see bottom in shoal areas. Turtlegrass: 16.24.02 N 86.20.22 W Look for the point on the West side that is half way up in the bight. Turtlegrass Marina, Roatán, Bay Islands, Honduras, C.A.